Campaigners outside William Patten Primary School, 2018. Photograph: CleanAir4Schools. A contentious council road closure scheme would see pollution increase on Stoke Newington Church Street, according to updated figures released today by the Town Hall. The council has been consulting since December 2017 on proposals to reduce ratrun traffic around Walford, Brighton and Nevill Roads, but has experienced significant pushback from campaigners over the impact the displaced traffic would have on schools and businesses. After concerns were raised about the accuracy of its traffic and air quality estimates, the Town Hall decided to carry out new analysis. That data has now been released, and it predicts adverse effects across a number of different sites on Stoke Newington Church Street, with small rises in pollution levels across monitoring stations near school facades. A spokesperson for campaign group CleanAir4Schools said: “The report confirms our fears that the road closures will worsen air quality for thousands of young children at numerous schools and nurseries which are already over or dangerously close to the legal pollution limit. “A leading paediatrician has already warned the level of extra traffic displaced past schools by these closures could increase the risk of children developing life-threatening or life-limiting respiratory problems. “In light of this air quality model, it’s completely unethical for the council to even consider going ahead with their plans. “We’ve found flaws and misleading claims in many of the documents put out by the council in relation to these proposals and hold little faith that these air quality reports will be any different. The closures could be carried out in two different models – under Option A, Barbauld Road would be permanently closed where it intersects Albion Road, and Allen Road where it meets Shakespeare Walk. Option B would see a permanent closure of Nevill Road between Osterley and Walford Roads; Clonbrock and Allen Roads at their junction with Nevill Road. Consultation data on the plans released by the Town Hall shows that, of 2,231 people responding, 61 per cent opposed Option A, and 53 percent opposed Option B. While most of the impacts on schools in the affected areas are listed as ‘Negligible’, eight of 14 schools monitored would see slight rises under Option A, and 10 out of 14 under Option B, with St Marys School on Barn Street and Grasmere Primary School on Albion Road seeing increases described as ‘Moderate Adverse’. The council has sought to reassure parents that these impacts will be mitigated by a number of measures, including green walls, the arrival of the Mayor of London’s forthcoming ULEZ scheme, and the relocation of bus stops. According to the Town Hall, under either proposal, school playgrounds at William Patten, St Mary’s, Grasmere and Princess May schools would still meet all types of air pollution limits in playgrounds. 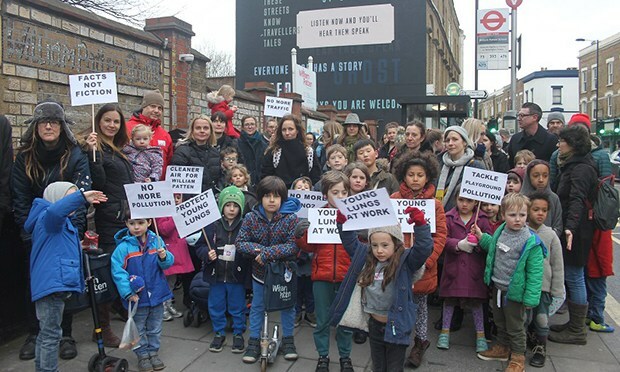 While some commercial locations on Stoke Newington High Street would see a lowering of air pollution, other monitored areas, in particular those on Stoke Newington Church Street, would see more of a proportional rise than those outside schools under the plans. Thirteen out of 20 locations at commercial buildings would see adverse impacts of varying degrees, with one location near the junction of Crossway and Stoke Newington Road seeing a ‘Substantial Adverse’ impact under both versions of the plan. Almost 60 Stoke Newington businesses signed a petition protesting against the proposals, fearing a rise in traffic on Church Street. As expected, both options for closures would see better air quality for the residential roads in the Walford Road area, which Hackney’s deputy mayor has said is one part of the Town Hall’s endeavour to “undo behaviour that has been normalised for a hundred years – the right to drive wherever you want, whenever you want”. The council has published interactive maps online for residents to explore what effect the proposals would have on their area, which Cllr Feryal Demirci (Lab, Hoxton East & Shoreditch), deputy mayor and cabinet member for transport, has said is an attempt to “arm” residents with information. The transport boss stated that she “regrets the bad media” which has surrounded the scheme, but reflected that whilst the council “still hasn’t perfected communication with our neighbours and residents, I don’t think you will reduce the noise that will come out from things like this”. Cllr Demirci said: “Hackney has worked really hard to improve cycling within the borough. One of our great schemes was the cycle superhighway, to create safer spaces for people who don’t usually cycle, not just lycra lads, to use. “We had created that in most of the area, but some of the changes had a knock-on effect of certain roads having hundreds of cars going down them on a daily basis as a result of displacement. So we were looking for ways of mitigating that impact. “We don’t have the capacity of doing a wider approach, but we are not planning to put in a scheme and walk away. We are constantly looking at new ways and better ways to improve air quality. “I hope CleanAir4Schools will take this as having taken their concerns really seriously and having gone as far as we could with this to demonstrate that this is for the benefit of the wider area and for our schools. Further decisions on the “direction of travel” for the scheme will be made in April, as the council looks ahead to the prospect of rolling out timed filters on a wider scale for major highways.